Pegasus War of the Worlds Martian War Machine 1:48 Plated model kit - BACK IN! 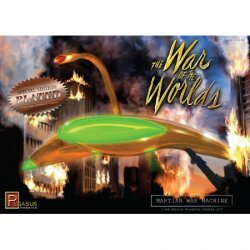 MyMovieMonsters.com > Model Kits > Pegasus > Pegasus War of the Worlds Martian War Machine 1:48 Plated model kit - BACK IN! Relive the excitement of the classic 1953 sci-fi movie The War of the Worlds with the most accurate model ever produced of the Martian War Machine! This is the 1:48 scale (11 inches across) Chrome Copper Finish Plated Special Edition Kit. Rifle-fire, rockets, cannon-fire, missles, and bombs are all merely brushed aside by the deflector shields of the alien vehicles. The graceful lines of the War Machine completely belie their awesome destructive potential. The hover forward on a tripod of electrical energy, completely ignoring all of man's efforts to stop them. The townsfolk flee, as the army makes a desperate stand. Reports come in that the same thing is happening all over the world. Can nothing stop the Martians? This brand-new, factory sealed 1:48 scale Chrome Copper Finish Plated Special Edition Kit includes one War Machine in 16 pieces, as well as planet display base and stand. Paint and glue not included. Ages 13+. Modelers Note: Photos are of a built and painted model kit. See our other Pegasus Hobbies kits, too.